We send thanks to our valuable customer who forwarded us this pic of a ‘Pet Relief Area’ from JFK airport in the U.S.A. These areas are also referred to as pre-security or post-security relief stations. Service dogs need the bathroom too and it is only fitting that an airport should cater for them. A service dog is a canine trained to perform tasks to support an individual with a disability. Although service dogs are not pets, pet dogs are permitted to use these purpose built areas as travellers move their dog from one place to another. In recent years there has been increasing numbers of companion or emotional support dogs accompanying their owners and it is necessary to provide facilities so canines can avoid having to exit the terminal for toileting. 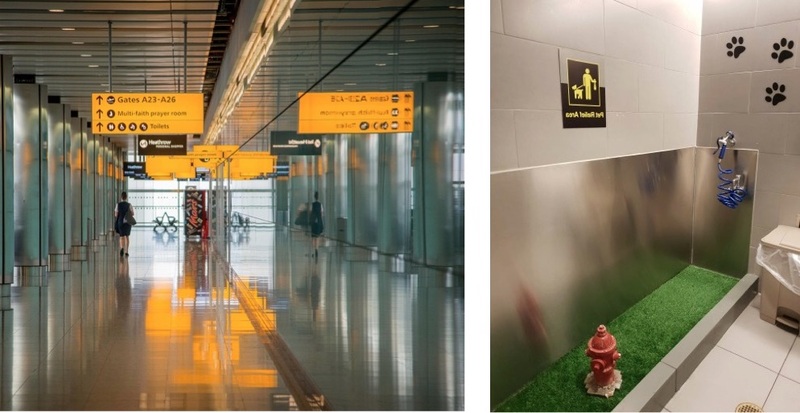 Though the area photographed is indoors, many terminals also provide a specific outdoor place for a pooch to potty. In many airports, pet dogs are required to remain inside their carriers other than when they are using the pet relief area or being processed through security. Synthetic grass, gravel and doggy waste bags are provided so owners can clean up after their pet. Of course a hand washbasin is installed and staff regularly service the area. The pet potty area pictured uses an automated system, which dispenses a cleaning solution to wash area waste from beneath the synthetic grass. Phoenix Sky Harbour have named some of their pet relief areas individually such as ‘The Pet Patch’, ‘The Paw Pad’, ‘The Bone Yard’ and we just love this one… ‘Park & Bark’. If you are travelling anywhere with your dog, remember that it may be difficult for your pet to relax and potty-perform just where you want it to. New sights, smells, sounds and surfaces can come into play. One major benefit of using a key word such as ‘toilet’ when your dog ‘goes’ is that in a new situation the word can help trigger the response as well as giving permission and help your dog to relieve herself on command.